It is late. It is early. tidying away the toys of summer. before the harsher times ahead. as bottomless as a December night. before this is played out. a bonfire for the rest. the folding gold falling around us. 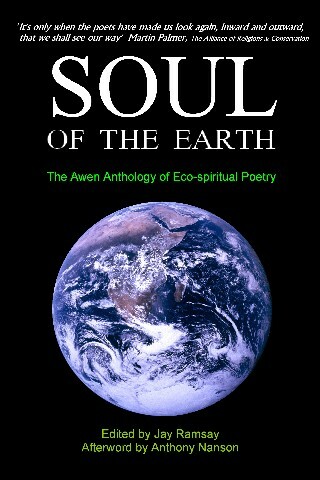 First published in Soul of the Earth (Awen 2010) and soon to be featured in the forthcoming Silver Branch: bardic poems by Kevan Manwaring (Awen 2017). This entry was posted in Bardic Poetry, Spoken Word and tagged Autumn, Poetry on October 18, 2017 by Kevan Manwaring. My garden universe, on the cusp of autumn – I walk up it at the beginning and end of the day, natural diurnal punctuation, the parenthesis in which my life fits. The various fruit trees this neck of the woods is graced with are like sephiroth on a Tree of Life – or one of the nine worlds of Norse mythology… Appleheim, plumheim, pearheim… I pick blackberries in the rain, and my fingertips turn pink. 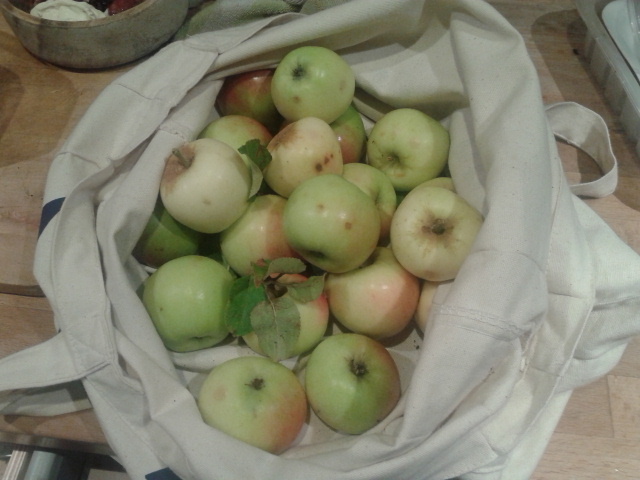 I return to the hyperabundance of the orchard and pick a bagful of different varieties (and some plump toms). Then, one more time for kindling. Thank you, bountiful garden. Now I have a crumble in the oven and firewood ready for burning. 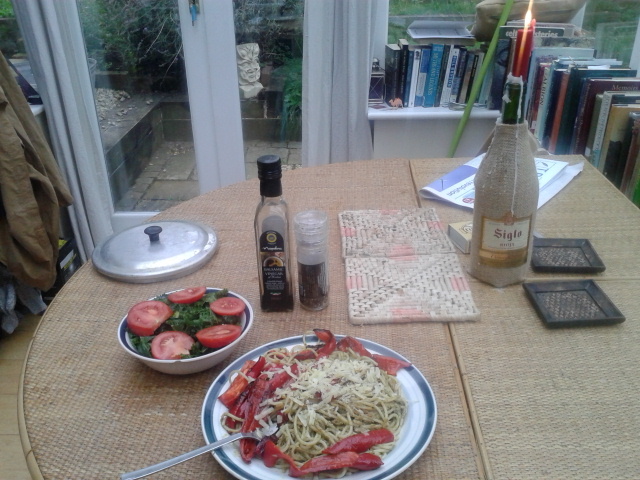 Its lashing down on my conservatory, but my heart feels blessed. Since moving into my new place in August I’ve seen the fabulous garden (shared with my landlords) in its summer glory, and now laden with autumn riches. I am loving ‘tending the hearth’ (inside and out) and feel blessed to have such a space. This Sunday was a particularly idyllic day – I awoke in my bell-tent, where I had decided to spend the night, to the most perfect autumnal day, the trees emerging through the morning mist, slowly burning off in the light of the new sun. Richard Jefferies wrote that ‘the dawn makes a temple of the Earth’, and that’s how it felt that day. I made porridge on my stove in the tent, and picked blackberries from the bushes to go on it. I greeted the day with my ‘Sunrise Praise’ then set to picking apples – for today was ‘juicing day’. Our neighbour had made a hydraulic apple press, and everyone on the street was bringing their apples to press. Picking fruit is a soothing and satisfying thing to do. This is ‘hand-to-mouth’ living the way nature intended. After getting washed and dressed, I helped wash the apples collected from our mini-orchard with the children. The youngest rescued ‘chucky pigs’ – her cute name for bugs – from the dunked apples. C turned up and when went for a spin on my motorbike to May Hill – walking in the footsteps of Edward Thomas and Robert Frost, exactly a hundred years on from when they first met and started to forge their creative friendship – supporting each other in their writing, while living a stone’s throw from each other near Dymock with their wives and children. They enjoyed long literary rambles, which they termed ‘walks-talking’, and visited May Hill on several occasions – a noticable landmark in this part of Gloucestershire. It was a beautiful sunny day, and we trekked up through the woods to the hilltop. Sitting on a bench we had our packed lunch whilst enjoying the stunning views over the Severn – which snaked like a silver serpent in the distance. 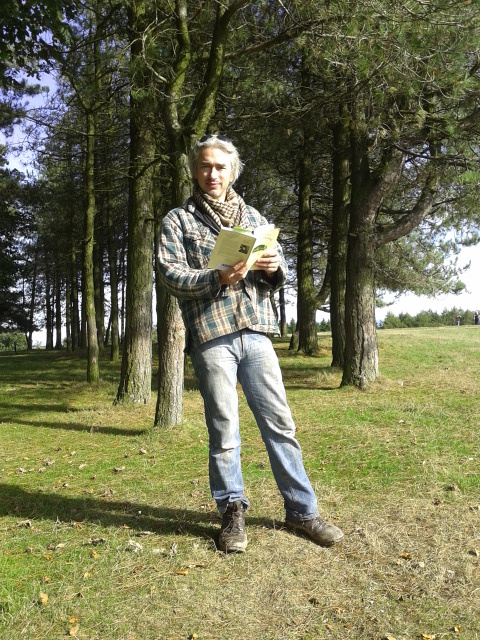 We read out poems in situ – most notably ‘Words’, which was written on the summit. When we got back we chilled out a bit, listening to a Poetry Please special on Charles Causley, (well C knitted socks while I had a bardic siesta ;0) before taking down the bell-tent, which had been up for a couple of months – it felt like ‘rolling up summer’, or ‘bringing the hearth inside’, as C put it. 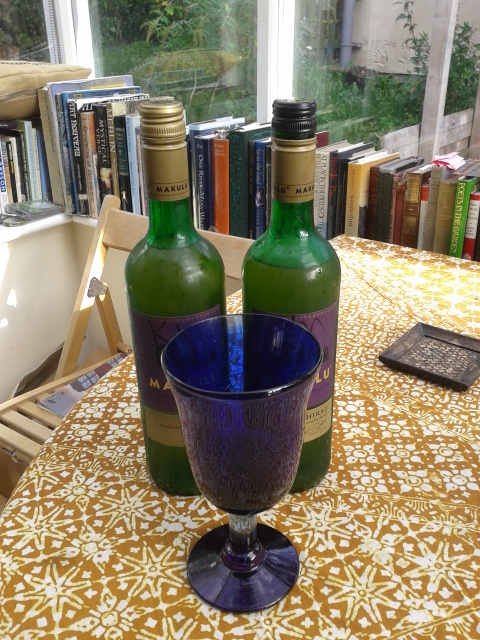 By the time we had lugged everything inside, there were three bottles of apple juice awaiting us and a small jar of tomato chutney – what riches! 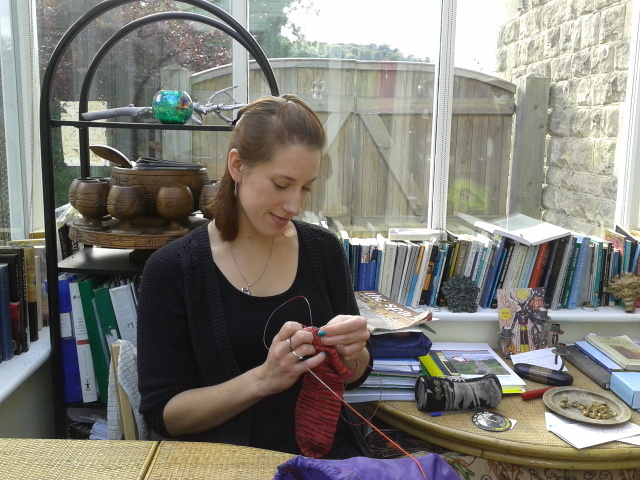 Improve your socks life – with C.
With a bag of apples from the garden, we made a Dorset apple cake; and then I made a nut roast for our main course. Later, by a crackling fire we shared stories we had written – the perfect end to a perfect autumnal day. 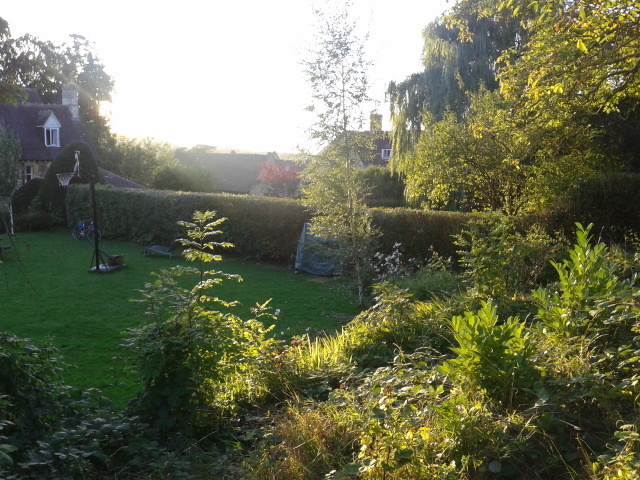 (I’ve never been green-fingered, and normally like nothing more strenuous than hanging out in my hammock in the garden, but something about this new place inspires me to get ‘stuck in’ – there are raised beds, fruit trees, peace and space. It would be a crime not to make the most of it). 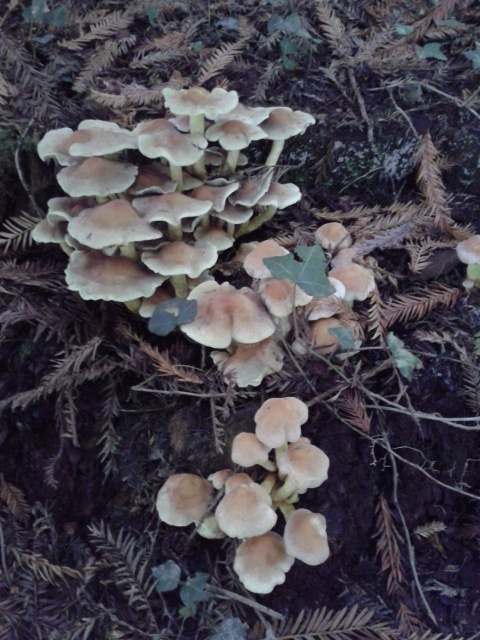 Fungal treasures on our autumn walk – best to check that mushroom guide! I pick apples from the espalier, near where the bees buzzed around the lavender only a few weeks ago. Logs are stacked from a tree (sadly) felled to make room for the conservatory – now my dining area. Clearing room for new growth is a part of the life-cycle of all things – if there is no break in the canopy, new trees cannot flourish. We all need some light, rain and soil, and deserve a place in the sun. In the summer, I sit by the woodstack, where windchimes spiral lazily in the breeze. Behind, a compost bin is like a seething cthulu city – its pungent loam rich, dark and warm. A yew tree shelters a cross-section of bikes – in ascending sizes, like a tree-ring of childhood. The hedgerows are neatly cut back – given a sensible short back and sides for winter. Leaves from the three plane trees planted by the owners, lie curled and brown on the lawn like screwed up of poems. The ash tree – a witches knot of trunk and branches – sits in the corner in its own realm, laden with bunches of ash-keys, wreathed in ivy, overshadowing the swings like a kindly old crone waiting for a visit. The brambles have lost most of their bounty now – the few remaining berries losing their sweetness daily. Leaves like tongues turn to flame – the colours so livid, as though they have been dipped in dye. 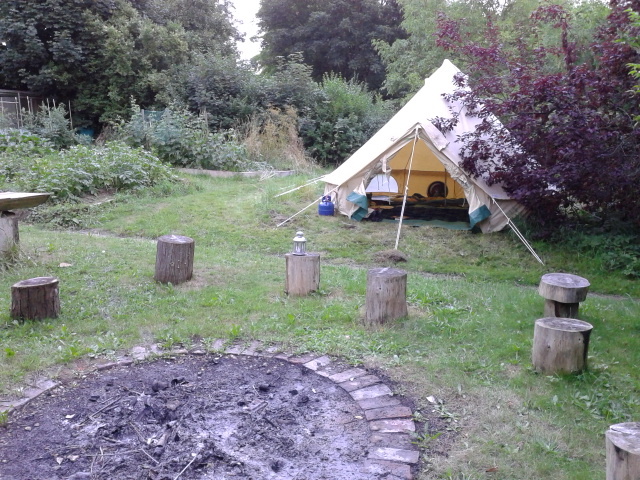 There’s a brown patch where the tent was – the hole of summer. 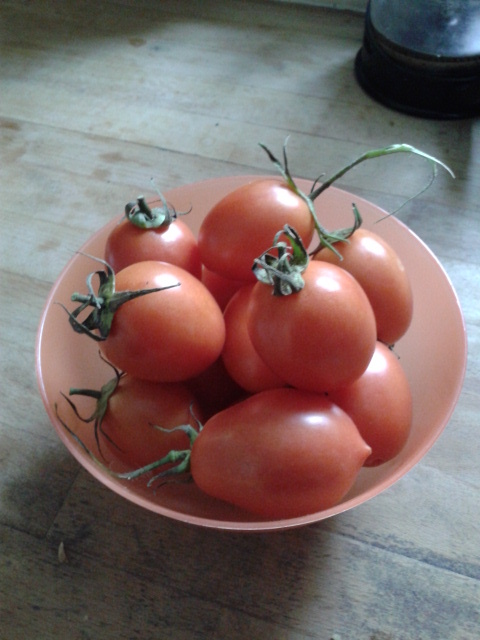 The tomato plants have so many red fruits – like a collection of clown noses. The apple trees, stripped of their casual treasure, have been pruned back. At the top of the garden, a secret realm – of hidden delights: a plum tree, a pear, a giant Scots Pine, guarding the border of our kingdom like some wizened sentinel. There’s a through-route for a family of foxes, their den nearby. One night I saw a trail of their burning eyes, caught in the beam of my headtorch. 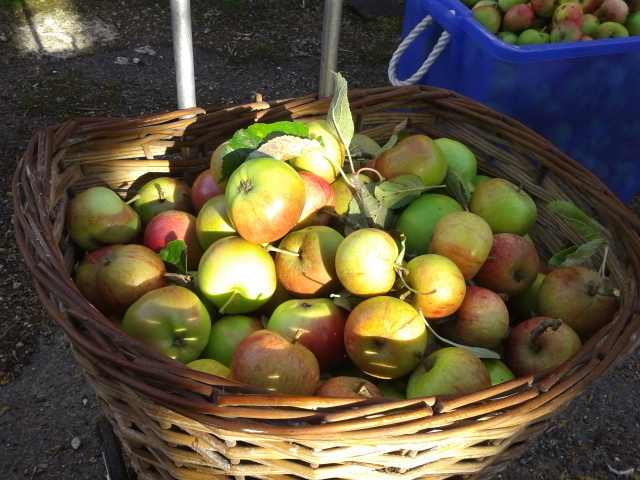 A pile of undersized apples moulders on a neighbour’s compost heap like unwanted metaphors – our windfalls are collected for Paul’s pigs. Standing amid the orchard is like suddenly stepping into a fairy tale – you are presented with a Goblin Market of choice. A grey cat appears – its fur like smoke. It sidles up and mewls like a baby, letting me stroke it. 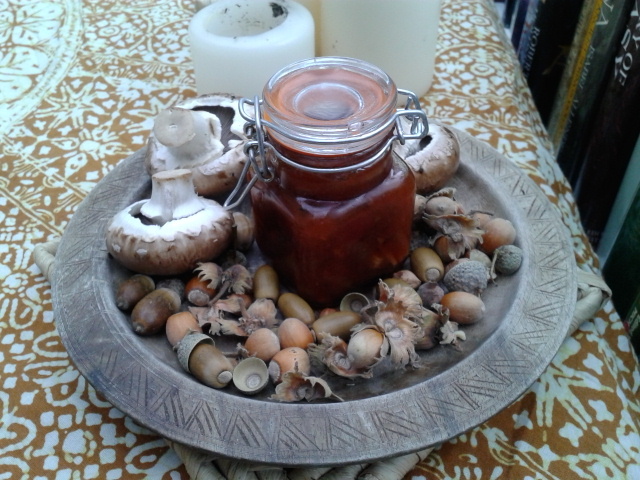 The walnut tree has been ransacked by Ratatosk – but I’m just as guilty, scrumping the toms, I carry a load back in the belly of my cardy like some marsupial papoose, hoarding autumn – the last blessings of summer. 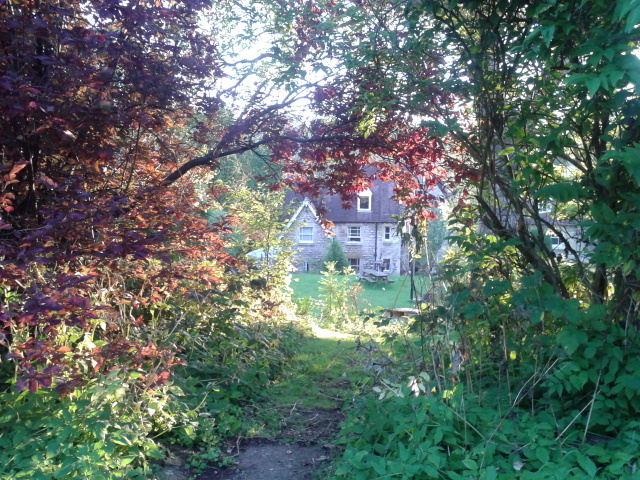 This entry was posted in bard, Green, Seasonal and tagged apples, Autumn, blackberries, community, Dymock Poets, Edward Thomas, Fall, foraging, free food, garden, Green, May Hill, Robert Frost, seasonal on October 9, 2013 by Kevan Manwaring.